Visit Cellular Factory, online at CellularFactory.com, for cell phones, cell phone accessories, and accessories for all other electronics. Cellular Factory offers chargers, batteries, cases, and headsets for cell phones, as well as chargers, batteries, memory cards, cables, cases, and more for laptops, printers, cameras, and camcorders. Cellular Factory also carries, gifts, toys, computer parts, TVs, and gaming systems. Find all the top brands like Samsung, Motorola, Nokia, and LG at Cellular Factory. For the best Cellular Factory coupons, Cellular Factory discounts, and Cellular Factory promotions, check RetailSteal.com. 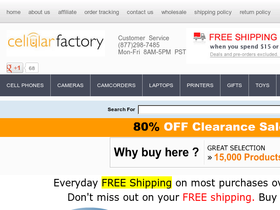 Cellular Factory offers free shipping on orders over $15. Returns are allowed within 30 days of ship date. See website for full details, exclusions may apply. Use the coupon code and get $10 off a $50 purchase online at Cellular Factory. Click link to save. Enjoy a $15 discount on all orders of $100 or more at Cellular Factory when you use this coupon code. Visit CellularFactory.com and use this code to get $1 off your order of $2 or more. Click link and enjoy. Save 30% on iPad 2 silicone and TPU cases with coupon code when shopping online. Use this code at Cellular Factory and get 20% off cell phone accessories. Click link and save. Head over to Cellular Factory today and use our coupon code online to save 20% on all merchandise. Shop at Cellular Factory and enjoy 20% savings on all orders. Click here for code. Use this code at Cellular Factory and save 15% on any order. Click link now. Use our coupon code online at Cellular Factory and save 15% on all merchandise. Click the link to shop today. At CellularFactory.com, save 15% on digital frames with this code. Click link to save. Head over to Cellular Factory and save 10% on your order with this exclusive coupon code. Receive 10% off your first order from Cellular Factory with this promotional code! Shop at Cellular Factory and enjoy 10% savings on siliconen cases. Click here for code. Get free shipping on your order of $15 or more at CellularFactory.com with this code. Click link to shop. Shop at Cellular Factory and enjoy a free car charger with purchase of phone. Click here for code. Get 80% off retail prices when you shop online at Cellular Factory. Click link to save. Check out the hot deals at CellularFactory.com and save up to 60%. Click link to save.